The Light Car motoring magazine. Homepage. This page: Despite the Second World War being in full swing, magazines from the 1930s continued to be published. This magazine is perhaps most often associated now with motoring in the 1920s and 1930s, when it was still known as The Light Car & Cyclecar, rather than during the dark years of austerity motoring endured in, and after, WW2. Prior to the war, the magazine was a full-sized publication, and sold on a weekly basis. Pages would overflow with advertisements for all the latest makes and models, motoring accessories, information on day trips to the coast, and a wealth of information on the latest design trends. However by April 1943, the date of this copy, things had changed significantly. 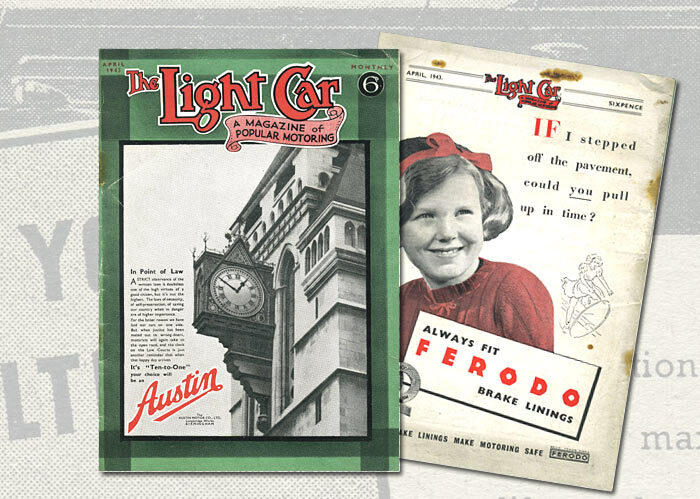 No longer was The Light Car a weekly magazine. Enthusiasts yearning to read about motoring during the war had to make do with a monthly fix instead. Gone too the full-sized layout, replaced by this smaller replacement, approximately A5 in dimensions. Motor manufacturers' advertisements during WW2. "A strict observance of the written laws is doubtless one of the high virtues of a good citizen, but it's not the highest. The laws of necessity, of self-preservation, of saving our country when in danger are of higher importance." "For the latter reason we have laid our cars on one side. But when justice has been meted out to the wrong-doers, motorists will again take to the open road, and the clock on the Law Courts is just another reminder that when that happy day arrives, it's "Ten-to-One" your choice will be an Austin." Advertisements by other motor manufacturers, whose production lines had in the main switched to munitions work where once shiny new cars had been assembled, echo the sentiment of Austin's piece. Ford, The Nuffield Organization, Standard, Rootes, and Morgan all advertise, presumably to keep their names fresh in people's minds, at a time when new-car availability to the public was strictly rationed to essential users only. Curiously there are no Vauxhall advertisements, in this month's issue at any rate. 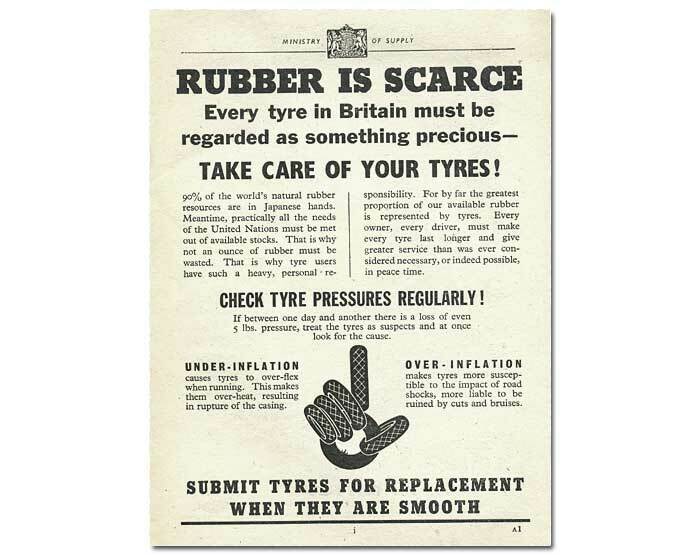 A two page notice from the Ministry of Supply drew readers' attention to the importance of preserving rubber stocks and, in particular, the efficient and careful use of motor-car tyres. With 90% of the world's natural rubber resources under Japanese control, all available stocks had to be managed with great care. Correct inflation of one's tyres was cited as being of utmost importance, with the damage caused by under- and over-inflation clearly described. Restricted motoring, and laying-up a car. However for many people used to driving their own motor-car in the late 1930s, the onset of war meant that their prized possession had to be retired into the garage, in the hope that better times were not too far away. An article entitled "The Laid-up Car" discusses the best way to go about this, the tips designed to minimise the extent of re-commissioning work that would be required in peacetime. The article opens with ways to prevent an engine from seizing solid. Oil, pumped vigorously down the spark plug holes, combined with regular turns on the starting handle, was the most practical way of avoiding seizure. If you hadn't taken this simple precaution, and on inspecting your car you'd found the motor stuck, at the very least you were faced with removing the cylinder head to have a proper look at the engine's innards. Regular use of the starting handle on a free engine was very much to be encouraged. Corrosion, and problems caused by condensation in many a British garage, were not limited to under the bonnet either. Dampness, as any classic car owner knows only too well, can wreak havoc to a car's bodywork and, more importantly, the structural elements hidden away from view underneath. Good ventilation in one's Motor House, or garage, was therefore essential, so regular airings afforded by opening the garage doors on fine days, would go a long way in staving off attacks from the metal moth (rust). Real moths, of the flying variety, also get a mention in this article. Moth balls placed strategically within the car's interior space would help keep damage to the seats and headlining to a minimum, it is said. The downside was that the car's interior would probably smell of the things for years afterwards! With few new developments circulating in the world of motoring at the time, many of the articles are of a general nature. One discusses the improvements that were seen as essential in the field of engine vibration and harshness. Included is mention of a one-off engine built by a Mr James Anderson of Renfrewshire. This eight-cylinder, horizontally-opposed engine was built up from two four-cylinder, Humber 9hp, engines. A special crankcase had been made, onto which both blocks were mounted. Each half of the engine fired as if it were on its own, ie one bank was timed as 1-2-4-3 and the other 1-3-4-2. Apparently a car with this unit fitted to it did rather well in Scottish hillclimb meetings prior to the war, its smoothness and power being "almost incredible", despite it being a two-bearing eight-cylinder engine. As already mentioned, rubber was in short supply. Another article looks at how everyone could help the wartime scrap drive. Readers were encouraged to have a good "spring clean" of their garages and sheds. All rubber items, such as old fan belts, horn bulbs, bicycle handlebar grips and pram tyres were all suitable for salvage. As for metal, old tins, spark plugs, tools and engine parts could be re-cycled into vital equipment for use in the Allies' offensive in Europe, as could brass and copper items. The Editor fills a couple of pages with his thoughts on three design features that should feature in the next generation of car designs. His first suggestion is that twin-tyred wheels should be fitted on private motor-cars. The benefit being, he suggests, that a puncture on one tyre wouldn't necessarily lead to loss of control while driving at speed. Also it would allow a driver to continue on their journey, until such time as it was convenient to effect a change of wheel. His second brainwave involves the fitment of a hand-crank for the engine, operable from the driver's seat. This lever arrangement would operate on a toothed cog fitted to the rear of the gearbox. Apparently a similar arrangement could be found on a number of much older vehicles, with marques such as Deemster, Duplex and Trojan given an honourable mention. In emergencies it could be used to start an engine, while during the winter it could be used to turn the engine manually, before the car's electric starter was pressed into service, taking some of the strain off the battery. This idea seems a little odd to me, as most cars in use in the 1940s still came with starting handles, although they required the driver to be outside in all weathers, whereas an internal lever would be more comfortable to operate. More exciting-sounding is his third suggestion, the incorporation of low-pressure superchargers within engines designed for bog-standard family cars of the post-war era. The intention would be to improve an engine's efficiency, rather than endow it with Herculean levels of BHP. Again, this was just one of several articles within this copy of The Light Car magazine that looks ahead optimistically, and at times wistfully, to a time when private motoring might pick up from where it was forced to leave off in 1939. Return to the car magazines section for information on other motoring magazines.